Updated at 8:12 p.m. on Monday, Feb. 11, 2019, with more information. The Georgia Bulldogs are struggling this basketball season, but help is definitely on the way. Anthony Edwards, the No. 2 national prospect in the 247Sports.com composite rankings, committed to Georgia on Monday. The 6-foot-5, 215-pound shooting guard from Holy Spirit Prep in Atlanta is the highest-rated hoop prospect ever to commit to the Bulldogs. Edwards picked Georgia and first-year Bulldogs coach Tom Crean over Florida State and Kentucky. "Two of my favorite players, Dwyane Wade (Marquette) and Victor Oladipo (Indiana), were coached by Tom Crean," Edwards said at his announcement. "He's a great coach. They didn't come in very highly rated and came out as great players." Asked by reporters afterward about picking Georgia over the other finalists, Edwards said, "I don't want to be like everybody else and go to the big bluebloods and all that. I just want to be my own." 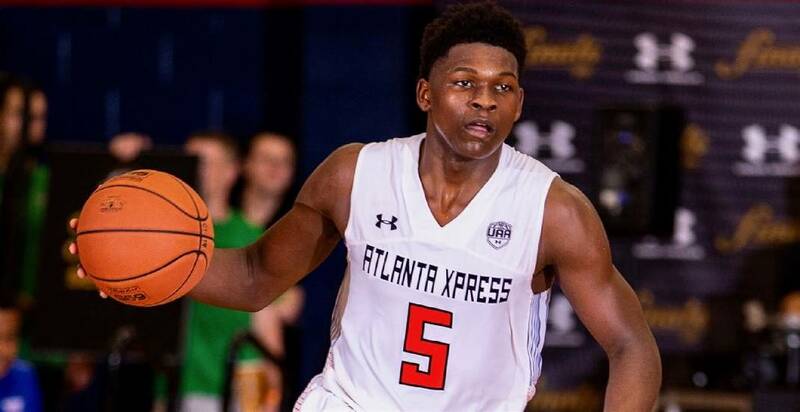 The top previous commitment for Georgia was Atlanta-area shooting guard Louis Williams, who was No. 6 in the 2005 class. That was an era, however, in which players could bypass college eligibility for an opportunity in the NBA draft, which he chose to do. Williams was a second-round pick of the Philadelphia 76ers and has averaged 14.0 points in his 14-year NBA career. The highest-rated prospect to play for the Bulldogs was shooting guard Kentavious Caldwell-Pope, who was the No. 12 signee in a 2011 class that was headed by Kentucky one-and-done standout Anthony Davis. Caldwell-Pope played two seasons with the Bulldogs, averaging 18.5 points per game as a sophomore, when he was the Southeastern Conference's player of the year. Caldwell-Pope was the eighth overall pick of the 2013 draft and spent four seasons with the Detroit Pistons before spending the last two with the Los Angeles Lakers. The commitment of Edwards comes several months after the Bulldogs lost Cartersville, Georgia, point guard Ashton Hagans to Kentucky. After helping the Wildcats to a 69-49 win in Athens on Jan. 15, Hagans told reporters that he would have signed with the Bulldogs had Mark Fox not been fired as coach last March. "We'll find some guys in this state who want to come and dip their toe in the water and say, 'We can do great things here,'" Crean said in a news conference after the Kentucky loss. "We'll get this thing built to the point where they know they don't have to go anywhere else." Edwards was in Chattanooga earlier this month for the Dr Pepper TEN Classic at McCallie School, when Holy Spirit Prep lost 72-68 to Hamilton Heights and fell 64-52 to IMG Academy. His commitment vaulted Georgia up to 12th in the 247Sports team rankings, with the Bulldogs having already received pledges from small forwards and top-100 recruits Jaykwon Walton (No. 68) of Montgomery, Alabama, and Toumani Camara (No. 95) of Hollywood, Fla. In a Monday meeting with reporters, Crean apologized for remarks he made following Saturday's 80-64 home loss to Ole Miss. "When I looked back at those comments, it looked like I was blaming the players, and that was never my intent," he said. "I tell them all the time that I believe in them, but I didn't say that (Saturday), and that was a mistake. I am definitely sorry, and I have apologized to them."